When I decided, sometime during 2015, that I was going to record again, and that I was going to continue down the chosen path that had led me to both "PARTING SHOT"(2011) and "SUBTEXT"(2014), I never imagined that I would end up recording 3 songs that had appeared on Bobby Hutcherson albums that I knew well from the mid-'60s. Of those same 3 songs, Bobby's own composition, "Head Start" was really the least likely, because I had never thought of recording it before. I already had an arrangement of "Rojo," also from Bobby's 1966 album "HAPPENINGS," that I had done for the Caribbean Jazz Project during 2000-2001. I had let Don Grolnick borrow my LP for Hutcherson's "DIALOGUE" album, on which the original version of Andrew Hill's "Catta" exists, so I had always loved that tune as well. As I began the process of creating my own demos for each song, I began to realize that "Head Start" could really be great, and my arrangement had it being played to the songo groove from Marc Quiñones' brilliant 1996 CD of "LATIN PERCUSSION SAMPLES." Everything seemed to be headed in a most positive direction, and at that moment, I just envisioned the piece as having my guitar and the band, nothing more. As time passed, and 2016 and the actual recording of the music approached, things were about to change. 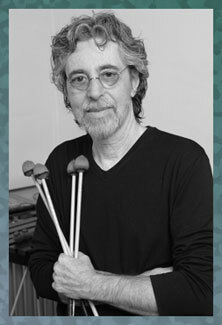 I had known vibraphonist Mike Mainieri since the early '70s, and he had played on one of my first albums as a leader, "THE BLUE MAN"(1978). We performed and recorded together as part of the Arista All-Stars in Montreux, also in 1978, and I had the privilege of being a part of Mike's wonderful album "WANDERLUST"(1980), and, some years later, two of his Steps Ahead projects: "N.Y.C. "(1989) and "Yin-Yang"(1992). So, needless to say, a deep personal and musical friendship had already existed for a long, long time. As "BACKLOG" began to take shape, and I knew, at that point, that both Randy Brecker and Bob Mintzer were going to be a part of the recording, I started to think that another melodic and solo voice might be great for "Head Start," but to have vibes on it seemed too obvious to me. So, initially I considered some other options, other instruments, other players. But, after a time, I thought to myself that I would be crazy not to reunite with Mike Mainieri, and have him perform on the album. And so, I sent him a letter with a CD-R of the demo, and asked him to listen to see if he would be interested in becoming a part of the album. Time passed, and I never heard back from him. I began to wonder if he had hated what he heard, and just didn't have the heart to tell me that he wasn't interested in doing it, or maybe he was angry at me about something from the past? Nothing made much sense to me. So, after some more time had passed, I decided to write him again, and I might have even left a voice-mail message for him, to find out what had happened to what I had sent him in the mail. Finally, he called me back to tell me how sorry he was that my small padded envelope had gotten lost in a pile correspondence on his desk, and that the envelope had even fallen behind the desk, and had been on the floor somewhere. After some intense searching, he found it, listened to the arrangement of "Head Start," and told me that he would love to play on it! Needless to say, I was absolutely thrilled. Now, I would have three old and dear friends, each a superb, brilliant musician on the recording with me. At some point, before the recording, Mike and I got together at his apartment, as we live in the same neighborhood in New York, and had a little meeting to discuss the approach to the tune, and I gave him the part that I had written specifically for him and his vibes. It was during that meeting that he told me that, Bobby Hutcherson was not feeling well, and that he had been forced to cancel some concerts that they had been scheduled to do together. When I heard that, I just knew that this was not one of life's little bumps in the road, and that this was most likely, very, very serious. Then, on August 16th, 2016, well after we had recorded the album in April, and mixed and mastered it in June, we all learned that the great Bobby Hutcherson had passed away. It was yet another very sad, sad day for the entire Jazz community. 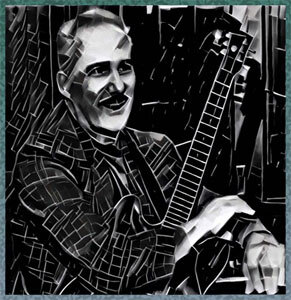 If you are at all interested, I sat down then, and wrote an homage to him at the TRIBUTES page at the site to express how much his playing and recordings had meant to me. It becomes a strange irony that he is so well represented on "BACKLOG." The process of envisioning another way to interpret "Head Start" is always a long road for me. When trying to create a Latin context for the song, I often have to start by coming up with a montuno that is going to establish the tempo, the mood, and the attitude of the entire piece. As the tune is centered around Ab minor, that certainly seemed like a good place to start, and there was some harmonic material in bars 7-8 of the melody in the original version. So these elements became important sign-posts in crafting an opening. Eventually, I had something that seemed to really fit the piece, and get it rolling. As I had already crafted the soli sections for both Ornette Coleman tunes, "Latin Genetics" and "Invisible," I wanted to do something a little different for "Head Start" and so, I thought that I would create two mini-solis, one each to precede each solo, and to serve as a chute into that solo. As always, I looked to the Hutcherson and Herbie Hancock solos from the original version, as there are countless memorable moments in each solo. I decided to extract a single phrase from each solo, and expanded it into an 8-bar melodic break before the vibes and guitar solos. The first soli appears before Mike's solo, and is labeled as letter [C]. It is drawn from a phrase that Herbie Hancock played at one point during his solo. The soli that appears before the guitar solo, that is labeled as [C2] is the one that is drawn from something that Bobby Hutcherson played during his wonderful solo. 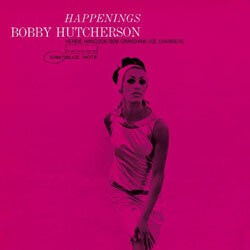 I should mention that Hutcherson's "HAPPENINGS"(Blue Note) album is one of my all-time favorites, and for countless reasons, and that entire session is moved forwards by the great playing of Bob Cranshaw(ac. bass) and Joe Chambers(drums). As always, I had to customize the solo section, and the changes for our purposes, and the only significant adjustment that I made was to bars 7-8 of what became labeled as the [D] sections of the tune. For the solos, the form retained its standard 32-bar form, but with these letters: [D]-[D2]-[E]-[D3], and each solo would be 3 choruses in length, and the guitar solo would be followed by a Mark Walker drum solo, whose length could be whatever he wanted it to be. And so, the piece was now ready to go. Or, so I thought! As it often happens, one can feel like you have everything sorted out, all the details are in place, just a simple rehearsal, and off we go, we're ready to record!!! But no, not so fast sonny boy!!! When it came time to rehearse "Head Start" with the band present, suddenly, Bobby Allende(conga) heard the rhythmic content of the tune going in a different direction. And, in this case, Marc Quiñones(timbal) was willing to go along with him, and they began to flesh out a different approach entirely. I was taken completely by surprise by this development, and I really did not fight hard enough for what I wanted the rhythmic feeling to be. 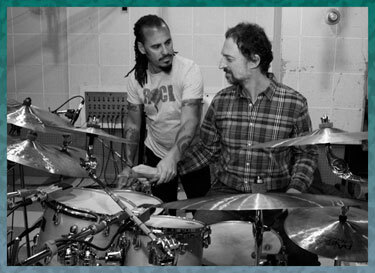 To be honest, I had never heard something like what Marc ended-up playing on his mambo bell, but somehow, Rubén Rodríguez, now on electric bass for this tune, knew just what to do, and together, they all advised Mark Walker on what direction the drums should take. The overdubbed hand percussion ended-up becoming the expected campana, and Marc decided to play the Brazilian triple Samba shaker instead of the güiro that I had expected. So, there were a lot of different elements that I had to deal with when it came time to mix this tune. It took me a long time to find a way to enjoy, in total, what we had all done that day. Now, let's get to the specifics of the solo. As it had been throughout this album, and the solos by Randy Brecker and Bob Mintzer, Mike Mainieri's solo on this tune really helped to give mine a great point of departure. Often times in Jazz improvising, the soloist is, of course, drawing from melodic material that already exists within the song itself, and whatever elements or fragments might have been improvised by the prior soloist. So yes, this is all part of the great tradition. Some players choose to ignore these things, but for me, it's important to stay connected to what has happened before. As we come out of each of the soli sections, the 1st bar of Chorus 1 is always left open, and includes the two ensemble hits in the 2nd-half of that bar on beat 3, and the and-of-4. In my case, I began to play at the end of bar 2. The solo begins in the range of the soli as I am playing over an Abm7 area. In bars 5-6, as the line descends, I pass through an A triad(Db/C#-A-E) to a lower Eb, an octave below where we began. The insertion of this particular triad is a common device as it outlines the area of the b5 of Eb7. As it always should be, keep your eyes and ears on the phrasing markings, and just how many phrases, throughout the solo, end on a long-short. From there, a brief breath, and then the chords in bars 7 and 8 are approached through their individual modes, in one case with chromaticism, in the other, without. So you have over Bm7, B Dorian [B, C#, D, E, F#,G#, A], which has several common tones to our Abm area, which I have hi-lited. Then on to Dm7 in bar 8 and D Dorian [D, E, F, G, A, B, C], as we turn back to Abm7 for the next section. The line out of bar 8 of the opening section, lands us on Bb(9th), an important melody note for the song itself, and from that register, I jumped up an octave to a higher Bb, and a line that descends through Ab melodic minor [Ab, Bb, Cb, Db, Eb, F, G]. This area, as opposed to playing in the more traditional Ab Dorian [Ab, Bb, Cb, Db, Eb, F, Gb] with a difference of only one note, is really connected to two influences:  one is how Mike Mainieri approached the Ab minor sections of his solo, in fact, all the minor chords, and  knowing the original version as I do, Herbie Hancock played in a similar vein. Bars 5-6 stay in that melodic minor area. But bars 7-8 of [D2] is where the section differs from both [D] and [D3], in that we are transitioning to letter [E], the bridge section, and Bm7. So over this first Bbm7 transition area, I again jump up an octave, and descend putting to use both Bb minor pentatonic [Bb, Db, Eb, F, A] and F minor pentatonic [F, Ab, Bb, C, Eb]. The crucial difference between the two is that the latter contains C-natural(9th), which provides a little more color. The arrival of letter [E] and the campana brings us the first chordal passage during the solo, and as I have previously written during another analysis, one of the most wonderful parts of McCoy Tyner's playing is when he slams down a 5th with his left hand, and then, this is followed by his intense chordal passages. Depending upon the key, on the surface, this does not seem like it should be too difficult to replicate on the guitar. But, in my experience, it is hard to achieve that same emotional effect and power. That stated, what I played in bar 1 over Bm7, is what we guitarists might describe as a power chord formation, and considering the guitar tone that I am playing with, this sounded really good to me for a change. The chords that follow, are spread voicings, mostly employing intervals of a 4th, but with the middle note repeated up an octave. The rhythms of these chords is important too, because they happen to be very much in alignment with the clave. Notice how the last chordal voicing in bar 4 ends on a high F#, and I begin the line over Gm7 with that same F#, and that note alone puts us in the area of G melodic minor [G, A, Bb, C, D, E, F#]. However, for bar 6, there is a return to the more expected G Dorian [G, A, Bb, C, D, E, F], with the F-natural making all the difference. Over the Ebmaj7 in bar 7, I am simply using that same general harmonic area, and transition to G minor pentatonic [G, Bb, C(6th), D(maj7), F(9th)] which instantly provides me with beautiful color tones. In bar 8, over the Eb7(alt.) chord, I am applying the Gb minor pentatonic [Gb, Bbb(A), Cb, Db, Fb(E)] which gives me all 4 altered tones: Bbb(b5), Cb(#5), Gb(#9), Fb(b9), and a much more angular, jagged feeling to the line. As we return to Abm7 for [D3], bars 1-4 feature an Abm9 descending arpeggio [Bb, Gb, Eb, Cb, Ab] in a sweep. Notice how each phrase ends with a long-short in bars 2 & 4. In bars 5-6, I use an ascending version of the same arpeggio sweep, but this time placing, what could be thought of as an Ebm9 arpeggio sweep on top of it, passing through [Eb, Gb, Bb, Db, F] while adding 2 color tones to the harmonic palette. From there, while remaining in the same register, over the Bm7 chord in bar 7, I am playing F# minor pentatonic [F#, A, B, C#, E], and in bar 8, over the Dm7 chord, I am using D minor pentatonic [D, F, G, A, C], nothing too fancy about that! Chorus 2 begins with a montuno that I came-up with that employs simple triads over the big tumbao in Ab minor of bassist Rubén Rodríguez. Bars 1-4 see these triads passing from G major-Gb major-Fb(E) major-Db major twice. If you look carefully at the top notes of each triad, you will see that they are passing through notes that are right out of the Ab blues scale [Ab, Cb, Db, D, Eb, Gb]! So, though it might sound a bit unorthodox, IF it sounds good to you, there is usually some logical reason as to why it might. In bars 5-6, the triad madness continues with Cb major to Db major over the Ab minor. Then, as we make the next two chord changes, in bar 7, over Bm7, we have a D major triad to E major triad, and in bar 8, over Dm7, the chordal passage continues with an F major triad to G major triad. As [D2] begins, there is a final statement of this triad-based montuno over the Abm7 chord. But, in bars 3-5, we then have the 2nd appearance on "BACKLOG" of my Psychedelic Big Band, courtesy of my Korg DVP-1 Harmonizer. Joe Zawinul's former keyboard tech, Ralph Skelton, helped me out greatly by rigging-up an on/off switch that enables me to use the DVP-1 whenever the moment seems right. The reason that I needed Ralph's help so badly was that, for some reason, the Korg designers did not give the user, the player, the option of being able to cue the effect in & out, or have your sound go through the chain clean. Not having a bypass switch is certainly an annoying omission. So Ralph, with his immense electronic problem-solving skills, designed a way to route my signal so that I could finally have the kind of control that I needed. I'm so grateful for his help. On the device itself, I can store up to 5 banks of sonorities, each with 8 programmed options. This gives me a wide harmonic palette from which to choose. I have these banks programmed in groupings so that each bank represents one of the principal chord families. To have these options, and to be able to employ them spontaneously, has been a great luxury for me. Normally, I position the DVP-1 to my immediate right, sitting in its black rack bag, and on top of my blue road case, so that I can take a breath, and reach out with my right hand, and then change the sonority within the bank that I've chosen. As the 2nd solo chorus continues, in bars 3-5, I used, what I have labeled as Sound #46. When using this harmonizer device, the trick is to always program the harmonized notes BELOW the one that you are playing. So in this case, the top voice is harmonized below by a perfect 4th [-5], a b7 [-10], and an octave [-12] giving the sonority a rather open suspended 4th sound. I like this sound choice as the top notes again reveal a proximity to the aforementioned Ab blues scale which gives the solo a sense of continuity and development. Between bars 5-6, after all this activity, there is another nice breath. The transition line over Bbm7 begins with a pick-up that, once again, surrounds the target note of Ab with its chromatic upper(A-natural) and lower(G-natural) neighbors. Then the line descends using notes that exist between Bb minor pentatonic and the Bb blues scale [Bb, Db, Eb, E, F, Ab]. Notice that this line concludes with long-short phrasing! As we return to Bm7 for letter [E], the first 4 bars offer a typical mix, for me, of lines and chord voicings that I associate with the left hand of a keyboard player. You see these sounds in bar 3, as F# is on top of each voicing and the lower two voices ascend in 4ths on each attack. In bars 5-8, I played sustained chords, each featuring small clusters. To support those sonorities, I overdubbed my Strat with the volume pedal and tremolo arm, adding some lower notes to fill out the sound. [D3] presents 3 phrases, all rhythmically related, and all beginning on Bb(9th), a very important note to Hutcherson's melody for "Head Start." Each phrase ends with long-short phrasing for the last 2 notes! In bars 7-8, over the Bm7, we are essentially in the B Dorian area. For phrasing, notice the little triplet gliss from A down to F#, this is a very simple and traditional Jazz phrasing element. With the inclusion of the E-natural, the line in bar 8 over Dm7 is probably more related to D minor pentatonic than to D Dorian, but you could think of it either way. [Chorus 3] begins just as Chorus 2 did with another strange little montuno. This one implies the sense of Am9(maj7) which bears a connection to some of the colors that Mike Mainieri created during his solo. If you are at all curious as to why there is no chordal accompaniment behind Mike's solo, or behind mine, it is specifically to allow the soloist the freedom to create linear and chordal colors without being constricted by the accompanist's sense of harmony. For me, generally speaking, this is the way that I feel most comfortable playing. If you were wondering, I don't think that I could have played any of these montunos if there had been accompaniment, because the clashes of notes would have been very, very ugly - in my opinion!!! Bars 5-8 see the return of DVP-1 harmonizer lines, and again, I chose to use Sound #46. The top voice line, with a touch of chromaticism, is right out of Ab Dorian, and notice how the notes in bar 7 over Bm7: B to F# are also common tones to Abm7: Cb-Gb. The usage of common tones, which you really just have to hear, gives a great sense of flow to any solo. Finally, in bar 8, the little motif of the previous phrase, an interval going down a 4th, continues up a m3rd over Dm7. Again, long-short!!! [D2], and the return to Abm, sees me continuing with the usage of Ab melodic minor, as you see more G-naturals and F-naturals appearing, and this gives the lines a very particular flavor. This idea pervades from bars 1-6. Pay attention to how each of the phrases ends! In bars 7-8, over the Bbm7 transition, the chords return in a different mini-montuno, which stylistically owes everything to both McCoy Tyner and Chick Corea's playing on Cal Tjader's 1966 Latin Jazz classic, "SOUL BURST," I owe a lot to Chick's comping style, and all that I gleaned from listening to that album during my college years and beyond. The mini-montuno cadences to a chordal punctuation up one 1/2-step over Bm7 as [E] begins. Then, in the rest of bar 1, and most of bar 2, there is another nice breath, and some space. In bars 3-4, we have the final appearance of the DVP-1 on this tune with a brief phrase using Sound #42. This is one of my all-time favorite sounds for certain sonorities and chords. The first time that I used it was in 1988 on the tune "Mambosa" which appeared on the "PUBLIC ACCESS"(GRP) album. This particular sonority offers a harmonization, below the note that I'm playing, of: a m3rd [-3]; perfect 4th [-5] and a m6th [-8]. I view the top voices of this passage as coming from the B blues scale [B, D, E, F, F#, A]. Over the Gm7 chord, I see this line as coming from the C dominant 7th pentatonic [C, D, E, G, Bb]. In bar 7, over the Ebmaj7 chord, this fragment, as I view it, is being derived more from its chord formation more than any specific modal or pentatonic idea. But those three pitches could be found in either one. Over the Eb7(alt.) chord in bar 8, this time, I am applying B dominant 7th pentatonic [B(#5), C#, D#, F#(#9), A(b5)]. By using this pentatonic, you are producing 3 of the 4 altered tones, it's a great option for this kind of angular linear improvising. One more strange mini-montuno begins the final [D3] section of the solo. If you only focus on the top melodic voices of this montuno, there is nothing so strange, over an Abm7, about seeing: Db-Cb(B-natural)-Bb. The points of interest are how those notes are colored from below. There is one last chordal punctuation on the downbeat of bar 5, and then a line, basically on the quarter notes descending through Ab melodic minor. In bars 7-8 the solo concludes with consonant lines over both Bm7 and Dm7, leading me into a reprise of the initial Intro [I] montuno for Mark Walker's great drum solo. 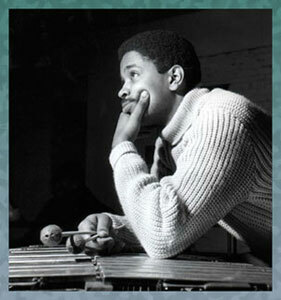 On the album, as it turned out, both of Mark Walker's drum solos appeared on Bobby Hutcherson tunes. And, those tunes appear back-to-back in the sequence as well. All of this was just a cosmic accident, nothing more. However, for Mark's solo on "Head Start," I had told him that the length of the solo could easily be adjusted, and that we could open up that section to whatever length he wanted it to be. But, though I asked him a couple of times, and even during the session, he seemed happy with the length. As part of his solo, to help to give it some additional shape, I had written a background line to be played by Mike Mainieri in octaves, and the appearance of that line would help to give Mark a sense of how close he might be to the end of the solo. Both of Mark's drum solos on the album are absolutely fantastic, and so very musical in every aspect. As I was preparing for mixing, of course, one listens to, and studies all the tunes, all the performances until you are intimately familiar with almost every detail - at least the ones that you can remember. As I studied "Head Start," and became more familiar with exactly what Mark had played during his solo, I was struck by how he had even managed to catch a number of the accents that appear in Mike Mainieri's background part, and this just seemed amazing to me that someone can play with such emotion, and still be attending to certain intellectual details that are within any arrangement. It just bespeaks of an incredibly high level of musicianship and talent. I was very lucky to have had Mark Walker as a part of this project!!! One other interesting anecdote from the process of creating this arrangement for "Head Start" is that, after I had created my demo, completely on my own, thinking that I had done everything correctly, and that, because my opening montuno was clearly in 2:3 clave, surely everything that followed would sound good in that clave as well. But, just to be certain, and well before I submitted anything to Marc Quiñones, I thought that I should make certain that all was in order. And so, once again, I sought out the help and wisdom of my dear friend, the great saxophonist/arranger from Venezuela, Rafael Greco to see what he thought of what I had done. As always, he was very kind and supportive about everything, but, with great respect, he wrote to me that he felt that the melody to "Head Start" seemed to feel better to him in 3:2 clave!!! You can't imagine how bummed I was to read that!!! So, I knew that I would have to add an extra bar before the melody, and then, another one to the section following the melody. Finally, another bar would have to be added to the phrase before returning to the melody, after the drum solo, turning the clave back around!!! Sounds simple, but, of course, it is a lot more work to do all of that. But, finally I did it, and sent it back to Rafa to make certain that this was close to what he had in mind. Receiving his approval, I felt much more confident heading towards my all important meeting with Marc. The day arrived and Marc and I sat down together in front of my computer, and I began playing him all the demos, as he followed along with the Master Percussion parts that I had sketched out for him. When "Head Start" finally came up in the order, I was certain that he was going to commend me for my adventures with the clave. But after he had listened, he said to me, with all due candor, "We can just play this in 2:3, and it will be fine!" I couldn't believe it!!! I had gone to all that effort for nothing. Some hours later, I wrote to Rafa and told him the story, and, of course, he laughed too, but explained that this was one of those melodies that could be heard/felt in either clave. And so, that was the end of that!!! I'm still not certain just what I've learned from this experience. But, I know for sure that, for me, it is always better to check with an expert before committing to an arrangement that might have a problem like this! As always, thanks so much to both Rafa and Marc!! !